Every year at the Duval Station Publix located in north Jacksonville, the men and women of Duval County Farm Bureau (DCFB) come together to give back to the community by way of paying the grocery bills for three families during Florida Farm Bureau Federation’s Food Check-Out Week. 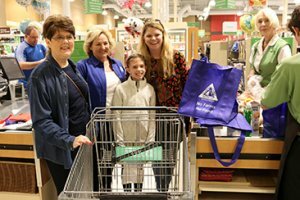 Members of the DCFB Women’s Committee serve as secret shoppers who look for consumers purchasing mainly fresh produce and meats according to Bonnie Bailey, DCFB Women’s Committee Chair. The main goal of the Food Check-Out Week is not only to give back, but to connect consumers with the local farmers in the area said Greg Tison, President of DCFB. The members of DCFB have built a program that not only supports a few lucky families, but also the Northside Christian Service Center (NCSC) at Highlands Methodist Church. DCFB purchases about $200 worth of non-perishable food items for the food bank, of which Publix matches dollar for dollar. According to the President of NCSC, Gwen Dube, the organization has seen an increase in need in the community. The food pantry is open on Tuesdays and Thursdays for those in need. The DCFB also donates a check of about $1,500 to the Ronald McDonald House at this event. The members volunteer at the Ronald McDonald House regularly and will even be cooking a meal there next month. “This is amazing, it’s like Christmas! Such a blessing,” One recipient said.